After last month’s record-breaking income, I received a more down to earth amount of £248.25. Total dividends this year now stands at £2,058.40, so I’m two-thirds of the way to reaching my goal. All dividends are reinvested, bundled up with whatever extra capital I invest monthly. With great relief, the domestic football season started this month, so plenty of new offers and of course, football accumulators (accas) to get stuck into. I ended last season on a negative after a bad run on the accas so have decided to cap my bets on these to £10 to keep the variance down. Anyway, it was a great month and I managed to get £894, my second highest month in profits since I started MB. For those interested, the profit ratio of actual MB (football and horses only), no-lay accas and no-lay EW betting was 18/18/64. People often ask me how much time I spend on my MB as they think it’s only worth them doing if they get what they deem to be a decent hourly rate. I don’t tend to log my hours because I think an hourly rate is what you consider when you’re doing a job and MB is a hobby which I do in my free time by choice. Anyway, I thought I’d make a note of my time spent on MB this month. It took me just over 22 hours to earn the £894 so that’s just over £40/hour. This is a lot more than what I earn in my salaried job! 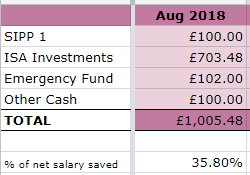 Of course, as you can gather from my monthly updates, my usual profits aren’t anywhere near what I’ve earned in August, but as none of my other hobbies (which I spend more time on) earn any income whatsoever, for me, it’s worth my spending a bit of spare time on MB. 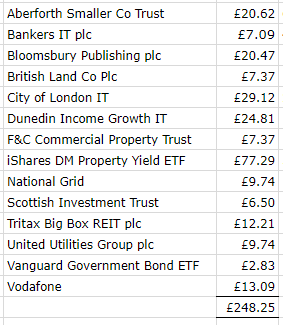 Total MB profits so far this year stand at £2,643, still well behind on my target but if I can score a decent average over the last few months of the year, I should be there or thereabouts. Matched betting isn’t for everyone but you won’t know if you don’t try! Anyway, check out (with no obligations) the free trial*. Yes, finally got one non-fiction book in the bag – a couple of fiction novels and then I hope to move onto the next one which should be an easier read! Might struggle with the library books goal now – have books lying around the house which I was planning to read this year. Think more time reading books, less time reading blogs is in order, haha! Anyway, hope you all had a great August! With the start of the football season, it’s probably the best time to start! Go for it and good luck! H Weenie -looks like another good month. And that matched betting income is fairly spectacular – what a great hobby, that pays you tax free. And glad you’ve got the house back to yourself again and all calm is restored. I know, I forgot to mention the tax free bit, which is of course another added bonus! Congrats on another good solid month – although below your targeted 50% savings rate that is still one heck of a good savings rate! The dividend graph is also coming on nicely, that has to give a nice warm fuzzy feeling looking back over the years and seeing the increases going? Really appreciate you logging the hours on the MB side of things – that is something I think I need to start looking into, even if I can only earn £100 a month extra, it could pay for a few bits extra! Thanks. I know it’s still a good savings rate but you know, just not to my own expectations! Yes, it’s great seeing that dividend graph going up. Hopefully the last few months will bring in enough to bag my target. Glad that my logging my MB hours were useful to you. When you first start out, of course, you’re likely to take more time/longer, but as you get used to the tools, you’ll be a lot quicker, so less time. £100 a month is certainly doable! If you ever need a hand getting started, give me a shout and I’ll gladly help out. Great job on the matched betting! I’ve often wondered how much time is needed to spend on MB each month, so thanks for breaking it down. £40/hour sounds like its well worth the time and effort. I’ll be starting on it from late December, so I hope there are some good opportunities then. 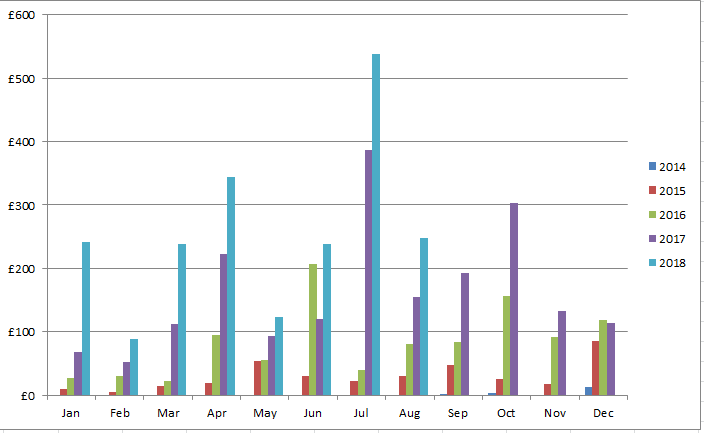 Note that I won’t always earn £40/hour – this was a particularly good month! Assuming I spend the same amount of time last month, then the rate drops down to around £13/hour, not so great but as I said, it’s a hobby, not a job. All the best with starting later in the year – as with @FiL, if you need a hand, drop me a note. Did I read that right, 64% of your MBing income is from AP EWS? That’s pretty awesome if so! What stakes and parameters are you using for it? Yes, that’s right. My max bets are £4/EW (I can’t stomach the huge variances like TFS does! ), min odds 6.0, 95% rating, <100% arb rating. I use 'dynamic stakes', ie lower stakes for higher odds. I use mostly gubbed accounts where I'm not severely stake restricted. Some of them still give me BOG so definitely worth milking them. Hello Weenie. Nice blog. In what way were your accounts gubbed? Thanks for sharing all this inspiring information. The gubbed accounts I’m using are the ones where I can’t take part in any offers, such any offer paying free bets or bet club offers. As mentioned above, the stakes aren’t severely restricted and a couple offer best guaranteed odds still. Thanks for the fast response. I hope you have a winning weekend! I’ve just started Matched Betting, encouraged by your results and through your links – massive thanks! I’ve earned £96 so far for a couple of hours work/learning, and as I’ve just retired I view it as a free money making hobby. Its a great side hustle – I can pick it up or put it down to suit myself (and holidays), and being entirely tax free it doesn’t affect your tax situation or benefits. I did make a few mistakes, lost about £3 of potential profit, but that only served to make me more determined to grasp it. I’m glad that my writing about my experiences persuaded you to enjoy some matched betting success of your own! I know – what a great hobby which you can just pick up or drop whenever you like, spend as little time or as much time as you wish. I hope I’ll still be able to matched bet when I retire – the tax free situation is ideal as it won’t affect any allowances or benefits. I’ve been matched betting for over 2.5 years and I still make mistakes, including backing/laying the wrong horse (with similar names), forgetting to lay, or laying the wrong amount! What I have to try to remember is that I’m not losing my own money, I’m losing ‘potential profit’ so best thing to so is just move on to try to make other profits! Another good month weenie, kudos! – Rating of 98% or better for $Markets, 95% for Betfair. – EW stake of 1% of bankroll rounded up to next £, or £2.50 (ew) whichever is larger. Note – I currently only use about 8 bookmakers, and only check the Oddsmonkey site 2-3 times a day, so could scale up. Also, if the odds shorten after I place the each way bet, I generally lay the win part, so far this has paid off so my real results are slightly better than shown. My best winner was ‘Fantasy Justifier’, £4 ew which won at decimal 15. That made me smile. Thanks Philip. That’s a great ROI you’ve gotten yourself and long may that continue. I’ve experimented with different ratings and found that I’m quite happy with the 95% rating. My stakes range between £1 and £4EW. I use around 10 bookmakers, of which 6 are gubbed. 26 placed (of which 9 < 98%) Total staked £503.10 Loss: -£174.12 Ouch. I was losing faith at that point but the strategy is to keep going and expected value will win in the end! Nice win on Fantasy Justifier, it's not one which I saw and if I had seen it, at 15 odds, I would have only backed it £3EW. Your future fund is so close to £150K now, you must be feeling excited to see it cross that threshold. It was interesting to see your time analysis on your hobbies! Every time I read about ew betting I’m tempted to give it a go, but it requires an OM subscription so I feel like if I do it, I need to be all-in for at least a month to justify the sub. If I do have a go I think I’ll need to revisit TFS 1st post so that I can work out what to do! *spolier alert* I had a pretty good August with my income hustles…I might just have had my first month where I hit my target! Will be doing an update post soon! Yes, I am excited at getting to £150k – feels like I’m climbing a bit of a hill but I’m near the top! The sub for OM isn’t much considering what you can earn just from normal MB offers, never mind EW betting. Check out TFS’ latest post where he’s earned over £10k in profit for August alone! I know, the mind boggles, but he’s on big stakes – I’m just showing what can be achieved with more moderate stakes. Great news on your August income hustles, well done! Hope you have a great September too. Wow! I really need to look into this matched betting hobby. I wonder if it would be taxed in Spain. Best to do your own research but I believe you’re taxed on gambling profits in Spain as it’s classed as ‘income’, unlike in the UK where it’s tax free. I think Betfair does accept bets from Spain. But with around 20% tax on prizes it might be tough to make it work. Thanks for the answer! I´ve read a bit about it and it is indeed taxed. Mr. Lyn recently posted…What would you do if you won the lottery? Hi Weenie, congrats on getting ever closer to your annual goals. Some serious dividend income this month and year to date. Keep going. i’m sure you’ll smash the £3,000 mark. Money Grower UK recently posted…Should I Hedge Currencies In A Portfolio? Thanks MG UK – I think I should get there. And I can see from your blog that you’re not doing too badly yourself on the dividends front – congrats!